[ALASKA]. Newspaper. New-York Tribune, July 17, 1868. Featuring the terms of the “Aliaska” Bill as passed by the Senate. Copy belonging to President Andrew Johnson. New York: Horace Greeley. 8 pp., 18 x 23¾ in. After suffering defeat at the hands of the British and the French in the Crimean War of 1853-1856, Russia feared losing the Alaskan territory in some future conflict. In an effort to protect Russian interests, Tsar Alexander II (1818-1881) determined to sell Alaska. After offering it in 1859 to the United Kingdom, Russia negotiated a sale to the United States, finalized in 1867. At the time, the territory primarily offered fur trading and some natural resources. Americans generally supported the purchase and believed it enhanced American interests in the Pacific, though some critics labeled it “Seward’s Folly,” after Secretary of State William H. Seward, who had negotiated the purchase for the United States. Most newspaper editors, especially those in California, were enthusiastic about the purchase. 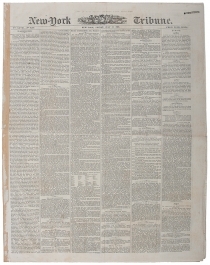 Notable among the critics was Horace Greeley, the editor of this newspaper and a long-time opponent of Seward. The value of the new territory increased dramatically with the discovery of gold fields in 1896. The Senate ratified the Treaty with Russia on April 9, 1867, by a vote of 37 to 2. On July 14, 1868, the House of Representatives passed a resolution appropriating the $7.2 million necessary to purchase Alaska (less than two cents per acre), and the Senate approved the resolution with amendments. The House refused the amendments, and the resolution went to a committee. The House passed the resolution as revised by the conference committee on July 23, and the Senate passed it the following day. Meanwhile, on July 15, Senator Zachariah Chandler of Michigan introduced “An Act to extend the Laws of the United States relating to the Customs, Commerce, and Navigation over the Territory ceded to the United States by Russia, to establish a Collection District therein, and for other Purposes,” and the Senate passed it on July 16. In the House, Representative Elihu B. Washburne of Illinois proposed amendments on July 25, and the House agreed to them. The Senate disagreed with the amendments, and this bill went also to a conference committee, where the Senate receded from its opposition, and the bill passed. President Johnson approved and signed both the joint resolution and the act on July 27, 1868. In 1870, Congress followed up its concerns about preserving fur-bearing animals expressed in this law with “An Act to prevent the Extermination of Fur-bearing Animals in Alaska,” aimed directly at regulating the killing of fur-bearing seals on Saint Paul and Saint George Islands off the western coast of Alaska, north of the Aleutian Islands. This issue also includes the Senate confirmation of William M. Evarts (1818-1901) as Attorney General (p1/c2, p5/c4); proceedings of Congress, including Senate discussion of this bill (p1/c3-4); a letter from a special correspondent describing Sitka, Alaska (p2/c2-3); an editorial nomination of Thomas A. R. Nelson of Tennessee as Secretary of State to succeed William H. Seward, “now that Mr. Seward has succeeded in buying Aliaska” (p4/c5-6); “base ball” and cricket scores (p5/c5); and a report on dozens of deaths from sunstroke during two-week heat wave, especially among children (p8/c1-3). New-York Tribune (1841-1924) was established as a daily newspaper in 1841 by Horace Greeley (1811-1872). 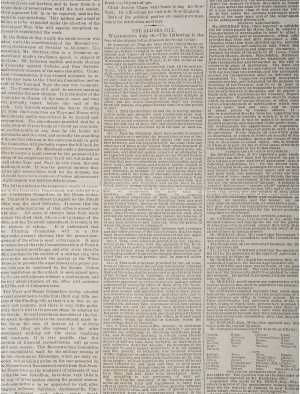 By the 1850s, it reached a circulation of 200,000 copies, making it the largest daily newspaper in New York City at the time. 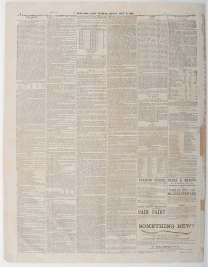 Greeley also published weekly and semi-weekly issues of the Tribune through much of his tenure. 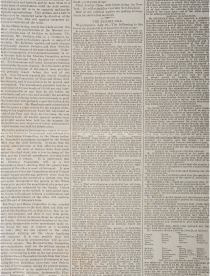 The New-York Tribune became the dominant Whig and then Republican newspaper in the United States, helping to shape public opinion, especially as other newspapers often copied its articles and editorials. It was one of the first newspapers in the Union to send reporters and correspondents to cover the military campaigns of the Civil War. Greeley used his newspaper to support many reforms, including abolitionism, pacifism, socialism (for a time), and feminism. After Greeley’s failed campaign as the Liberal Republican candidate for President, Whitelaw Reid (1837-1912) assumed control of the Tribune until his death. His son, Ogden Mills Reid (1882-1947), acquired the New York Herald and merged the newspapers in 1924. Typical folds and light foxing, few slight tears at some of the outer margins, and appears to have been bound in a book at one point or someone reinforced the outer fold.